There is evidence proving that the country was inhabited already about 2500 BC. European contacts with Sierra Leone were among the first in West Africa. In 1462 the Portuguese sailed along the coast of West Africa, and the explorer Pedro da Cintra sighted the mountain range overlooking what is now Freetown. When approached from the sea the mountains resemble a lion’s back. So he gave them the name of Serra Lyoa (Lion Mountains), later changed to Sierra Leone by the British. In the 16th century when the Europeans started to need a cheap source of labour for their plantations in the Americas slave trade became a lucrative business in Sierra Leone, as well as in the neighbouring countries. Around 1670 on the small Bunce Island a fortress was built which exported tens of thousands of captives to the new colonies across the Atlantic. The Europeans were supported by local chiefs, especially those of the Fulani tribal group, who supplied slaves from the interior of the continent. In 1787 British philanthropists established the „Province of Freedom“, that was to become Freetown. They thus created an important stronghold in the fight against slave trade. Life in the new settlement was very hard and many of the British settlers died of tropical diseases in the first year. In 1792 freed American slaves from Nova Scotia arrived in Sierra Leone. This group was later joined by a group of Maroons, freed slaves from Jamaica, who also arrived via Nova Scotia. In 1808 Freetown officially became a British crown colony ruled through a governor and in 1896 the interior of the country became a British Protectorate. During the colonial era there have been quite a number of riots and a strong resistance against the British rule. The Temne chief Bai Bureh conducted a ferocious revolt known as the Hut Tax War when in 1898 the British imposed a tax on every home in their protectorate. However, the British suppressed the rebellion and the tax was retained. In May 1957, Sierra Leone held its first parliamentary election. But it was only 4 years later, on27 April 1961 that Sir Milton Margai led Sierra Leone to Independence from Britain. The country opted for a parliamentary system within the British Commonwealth. Sir Milton Margai became the country’s first Prime Minister. Upon his death in 1964, his half-brother, Sir Albert Margai, was appointed as Prime Minister by parliament. The general elections held in 1967 were won by the mayor of Freetown, Siaka Stevens who was sworn in as Prime Minister on April 26, 1968. Within a few hours after taking office, Stevens was overthrown in a nonviolent coup. A counter-coup was launched, and Stevens assumed power again in 1968. During his time in power he gradually imposed authoritarian methods and created a one-party system in 1978. There were a number of military coups against Stevens, which were all put down. He finally retired peacefully from his position as Head of state in November 1985 handing power over to his loyal successor Major-General Joseph Saidu Momoh. Momoh’s government was characterized by corruption and instability, and finally led to a ten-year cruel civil war. In 1991 the rebel movement of Revolutionary United Front (RUF) attempted to overthrow Momoh with the help from Liberia’s warlord Charles Taylor. But the coup was put down. It was one year later that a group of young officers of the National Provisional Ruling Council (NPFC) seized the power in a military coup led by the twenty-five-year-old Captain Valentine Strasser. With Strasser as head of state the country fell into complete chaos. The RUF continued their fight against the government. The number of brutal rebel attacks launched from Liberia increased. The images of the child soldiers and the atrocities committed are known to the whole world. The brutal civil war was funded by the illegal trade in diamonds, the so called blood diamonds. After the intervention of the West African ECOMOG (Economic Community of West African States Monitoring Group), UN forces and the British Army in 2000 the peace process was finally launched. On January 18, 2002 President Ahmad Tejan Kabbah declared the civil war officially over. UN peacekeeping forces remained in the country until 2005 to help stabilize the security situation. They were replaced by the United Nations Integrated Office in Sierra Leone (UNIOSIL) which was established to assist the government and to help organize the elections in 2007. The population of Sierra Leone is estimated at 6 million and is rich of ethnic diversity. There are 16 ethnic groups recognised. The largest tribal groups are the Mende and the Temne accounting each for about a third of the population. The Limba form the third largest ethnic group in the country, about 8% of Sierra Leone's total population. 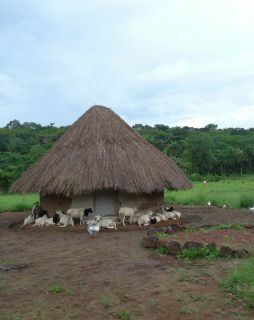 It is believed by some historians that they are the oldest inhabitants of Sierra Leone. The Krio also known as Creoles are the descendants of freed slaves resettled from Jamaica, England and Nova Scotia. They comprise only 2% of the overall population, but they play a dominant role in the country’s trade and business and are considered Sierra Leone’s intellectuals. The Kono are found mostly in the eastern diamond district making up about 5% of the population. 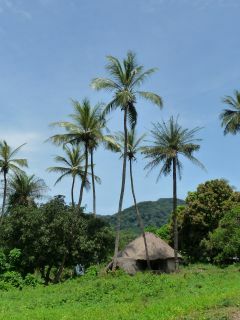 The Vai, closely related to the Kono, live in the area around Pujehun. The Sherbro also known as the Bullom live along the coastline south of the Freetown Peninsula. The Fula, known as Peulh in French, are distributed throughout West Africa where they were responsible for introducing and spreading Islam. Historically nomadic cattle herders they are now increasingly sedentary. There are also the Kuranko, the Susu, Yalunda and Kissi who originally arrived from Guinea, the Mandingo, who also played a principal role in the spread of Islam and the Loko, closely related to the Mende. Trade is dominated by the estimated 4000 Lebanese merchants and a growing number of Indians. About 60 – 70% of the population are followers of Sunni Islam which began to spread rapidly in the past 50 years. 20 – 30% profess Christianity, most of them are Protestants or belong to the New Apostolic Church. The remainder retain animist beliefs which often overlap with Islamic and Christian practices. Many Sierra Leoneans are members of a secret society. The majority of the people in Sierra Leone are tolerant of other religions, and mixed marriages are common. 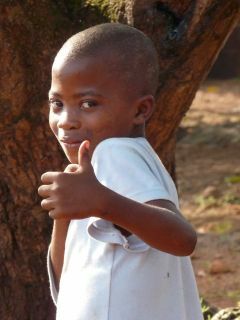 English is the official language of Sierra Leone, but only the well-educated people can read or write it. Krio, which is an English-based creole language,has developed to the most important language in Sierra Leone as it is used in practically all domains of public life and connects the majority of the Sierra Leoneans as lingua franca. 21 other languages besides English and Krio are spoken in Sierra Leone. Temne is the dominating language in the north and Mende in the south. Other languages include Bassa, Bom, Bullom, Fulfulde, Kissi, Klao, Kono, Gola, Krim, Kuranko, Limba, Loko, Maninka, Sherbro, Susu, Vai and Yalunka. 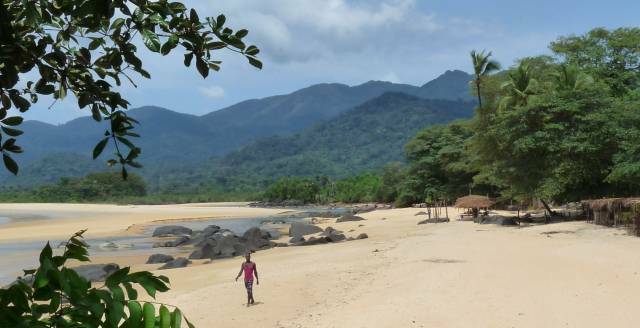 Sierra Leone's original rainforest once covered more than 70% of the country. Today, only 6% of the primary forest cover remain due to commercial logging and slash and burn agriculture. The last remaining patch of genuine rainforest is at Gola. The Red Mangrove (Rhizophora racemosa) is common in swampy areas. It grows up to 30m. There are dense mangrove forests around Sherbro Island. Among the giant forest trees there is the silk cotton tree (Ceiba pentandra), also known as kapok. The most famous silk cotton tree in Sierra Leone is found in the centre of Freetown. Silk cotton trees standing near villages and being surrounded by other trees are the symbol of the secret poro society. The rainforest is dominated by the fire-resistant red ironwood tree (Lophira alata) whose young twigs are used as tooth brushes by the local people. Another striking tree in the rainforest is Piptadeniastrum africanum with its enormous buttress-roots. The uapaca (Uapaca guineensis) particularly grows alongside streams and rivers. It has characteristic stilt roots The giant forest trees are often covered with epiphytes like orchids or bromeliads. One of the most common trees in open country is the Néré or locust bean tree (Parkia biglobosa). The kernels of Néré are fermented to make “kende” also known as "soumbala", a popular condiment used in West African cuisine. During the rainy season the savannah is dominated by elephant grass (Pennisetum purpurewn) shooting up well above head height. In Sierra Leone large oil palm plantations characterize the landscape. The oil palm is native to Guinea and is one of the most economically important species of palms. Leafs and branches are used to thatch roofs, red palm oil is extracted from of the pulp of the fruit and white oil from the kernel. They are both used in the food industry. Red oil mixed with cocoa pod ashes is used to produce soap. Palm wine, also known as Bandji or Doubié, is very popular.. Other useful trees cultivated in Sierra Leone include the large mango tree (Mangifera indica), rose apple (Eugenia jambos), papaya (Carica papaya) and guava shrubs (Psidium guajava). 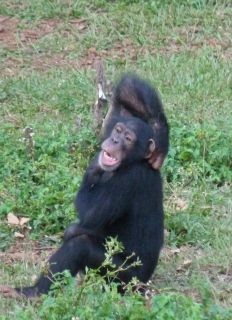 Sierra Leone boasts a large variety of primates. 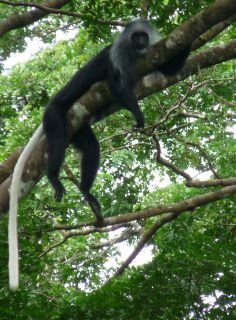 15 identified species occur in the country of which six are endangered including the Western Chimpanzee, the Diana monkey .and three species of colobus monkey. 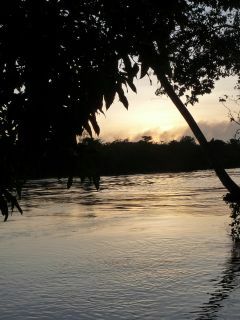 With Tiwai Island Sierra Leone has one of the most important primate conservation areas in the world. The wildlife reserve hosts eleven primate species and the rare pygmy hippopotamus living in the Moa River that surrounds the island. The Outamba-Kilimi National Park, Gola Forest and Mount Bintumani also offer good opportunities to spot primates. A small population of forest elephant occurs in Sierra Leone. The Outamba-Kilimi National Park in the north of the country offers the best chances of seeing them. The Little Scarcies River that flows through this park hosts hippos. The slopes of the Mount Bintumani are home to the rare dwarf buffalo that is smaller than the African buffalo found in the East African savannah. There are three species of wild pig that occur across Sierra Leone: the wart hog, the giant forest hog and the red river hog also known as bush pig which lives near rivers and streams. During a walk in the forestyou are very likely to discover evidence of its digging for roots. The lion after which Sierra Leone was named is extinct here. The only big cat that survives in the country is the leopard which has also become very rare. The smaller mammals include serval, African civet and genet, honey badger, different species of mangoose, porcupine and grasscutter. There are approximately 147 known species of wild mammals within Sierra Leone. About 630 bird species are known in Sierra Leone, more than 400 of them are resident. 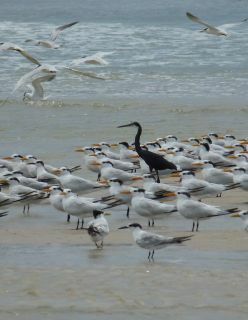 Among the best areas for bird watching are the Sierra Leone River estuary, Loma Mountains, Tingi Hills, Gola Forest, Outamba-Kilimi and the Western Area Peninsula. Weavers and bulbul are common, as well as white-tailed alethes. On Tiwai Island olive and spot-breasted ibises and green-tailed bristlebills can be spotted. A number of stork species are home to the country, including black stork, Abdim’s stork or marabou stork. Among the herons there are black-headed heron, purple heron and great egret. Various species of kingfisher, sunbird, hornbill, glossy starling are easily seen. Black kites and lappet-faced vultures are abundant. There are also 23 threatened species, including white-breasted guineafowl, the white-necked picathartes and the western wattled cuckoo shrike. There are three species of crocodiles in Sierra Leone: the Nile crocodile, the slender-snouted crocodile and the dwarf crocodile. Other reptile species include monitor lizards, five species of turtles, agama lizards, geckoes and chameleons. A large number of snake species exists in Sierra Leone including the black cobra, spitting cobras, Gaboon viper and the green mamba. Most snake species are very shy and not likely to be seen. There are about 130 species of freshwater fish in the waters of Sierra Leone. Sierra Leone has a total area of only 71.740 km², which makes it one of Africa’s smallest countries. It stretches from Liberia in the south to Guinea in the north and northeast. In the west it is bordered by the Atlantic Ocean. 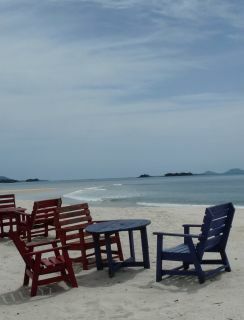 Its coastline measures 402km. In the west the low-lying coastal plain runs up to 80 km inland of the Atlantic coastline. There are plenty of mangrove swamps lining the coast. In addition to the mainland proper, Sierra Leone also includes the offshore Banana and Turtle islands and Sherbro Island. The Freetown Peninsula is the only part of Sierra Leone’s coastline where mountains rise on the sea. Its highest peaks are Sugar Loaf Mountain at 760m and Picket Hill at 888m. Inland lies the wooded hill region whose forests have been largely replaced by agriculture. Remnants of the extensive original rainforest only survive in the southeast of the country. Sierra Leone’s east is characterized by a plateau which is a part of the Guinea Highlands. Ranges on this plateau include the Loma Mountains, Tingi Hills and Wara Wara Mountains. At 1.709m Sankan Biriwa is the highest peak of the Tingi Hills and Loma Mountains are home to Mount Bintumani, at 1.948m the highest point in West Africa. The north of the country is dominated by a rolling savannah landscape. A number of large rivers flow southwest towards the Atlantic, including the Mano, Moro and Rokel. Much of Sierra Leone's economy was destroyed in the ten-year civil war. Sierra Leone's economy is predominantly agricultural, with approximately two.thirds of its workers engaged in subsistence farming. Sierra Leone's principal agricultural products are rice and oil palms. Oil palms are used to make palm oil and palm wine. The fishing industry is also important although the country is suffering a lot from the foreign fishing trawlers that cause a widespread decline in the amount of fish. Inland fishing also plays a significant role. The leading cash crops, which are exported, are coffee and cocoa. Sierra Leone is rich in mineral and natural resources. The main minerals extracted and exported are diamonds, bauxite and rutile although the illegal mining and trade in diamonds has negative effects on the country’s economy. A huge oil field was discovered off the coast.